As promised my fellow food bloggers and I are still stirring away (in case you missed yesterday’s post, this week I’m cooking and writing with six middle school students). Today we were treated to a visit from real-life pastry chef, Angela Gonzalez, of Mountain View-based Dial-a-Dessert. 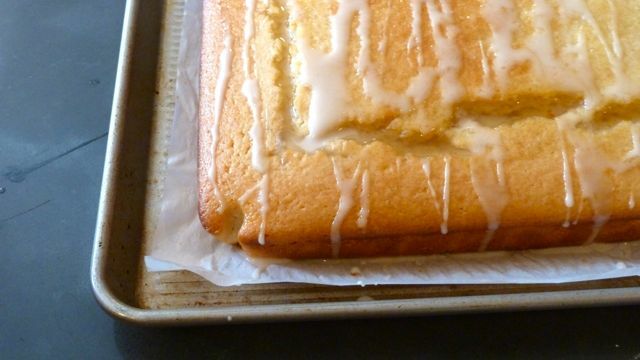 Angela patiently guided us through the steps in creating a luscious and tangy lemon yogurt cake (pictured above). Now we know why a few of the muffins we baked on Monday were a tad on the heavy side: too much, albeit joyful, stirring. Energy and enthusiasm are wonderful, but don’t always lead to a light and airy cake crumb. “Easy does it” is our newfound baking mantra. The kitchen truly is a place of learning. 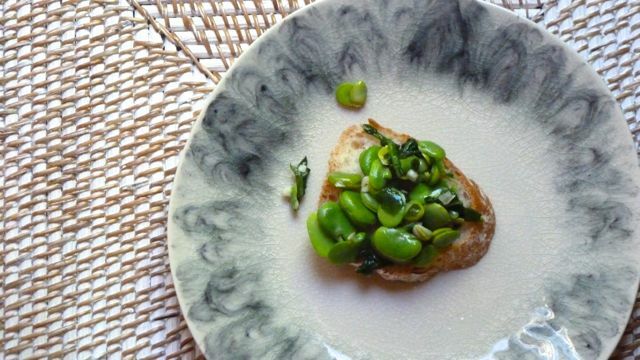 While our lemon cake baked we stood around the island shelling fava beans and sharing cooking stories—then sautéed our leprechaun green legumes with minced garlic, fresh spinach leaves and a squeeze of lemon juice, and spooned them on toasted baguette for a quick snack. The recipe is simple and adaptable. Stir the beans into cooked pasta or whole grains like brown rice, if you prefer. Tomorrow we plan to retire from the kitchen as a group and instead, squeeze fresh lemonade, then hike to a nearby park to relax and nosh on the spoils of the week—and wile away some well-earned time off. Every hard-working cook should, now and then. Thanks for a fantastic week of learning, girls. Your willingness to try new foods impressed even this old lady, who eats almost anything. I’m not sure how up for fava beans, or parsley oil, I would have been in middle school (aka junior high). Maybe we’ll meet again in the kitchen next intersession. We loved your cake. We were bombarded by requests for tastes from friends! Thanks for coming in and helping us bake.